A bright, salty vinaigrette adds tons of flavor to this cold noodle salad. 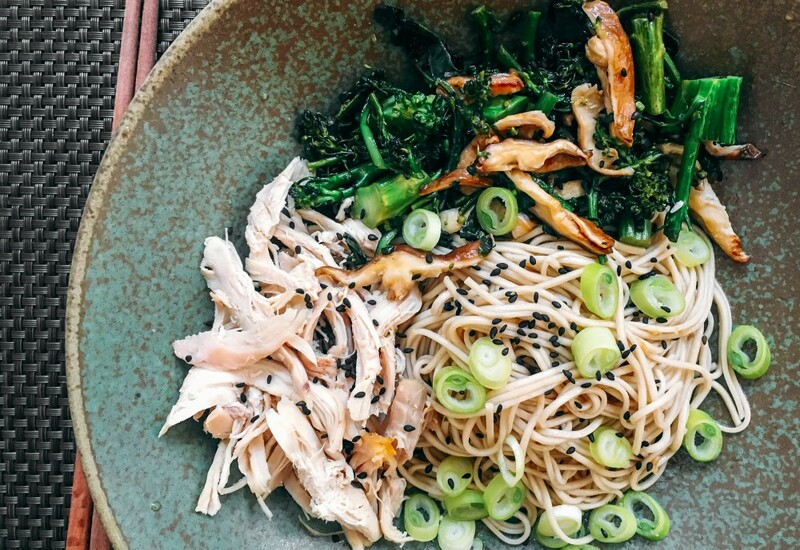 Filled with Asian pantry staples like ginger, rice vinegar, sesame oil and soy sauce, the savory dressing smoothly coats the soba, shredded chicken and vegetables. We chose quick-cooking broccolini and shiitake mushrooms for ease and flavor, but you could also try it with other crisp veggies. This noodle dish is delicious eaten just after it's prepared, but is maybe even better the next day, after the flavors have had time to meld. It makes a wonderful lunch to bring to the office, or a make-ahead picnic dish. Skip the chicken and add cubed, pan-fried tofu to make it vegetarian. Alternatively, pile on the veggies by adding other fast-cooking vegetables like sugar snap peas, broccoli, or zucchini to the pan, or stir in raw cucumber with the noodles and dressing. Per Serving: 587 calories; 36g fat; 22.1g carbohydrates; 48g protein; 145mg cholesterol; 1451mg sodium. Good dish and fairly easy to make. We bought the rotisserie chicken as in the directions and the rest if just focusing on the noodles. We tossed in some bok choy with the noodles. This cold soba noodle recipe was really tasty. The soy-ginger dressing was definitely my favorite part. I had leftover chicken so it was really easy for me to shred and toss it in this dish. It was perfect for my lunch! This chicken and mushroom soba was amazing! I also really loved the ginger soy dressing. The broccolini was the was the perfect addition. I will definitely make this dish again! I skipped the chicken but added extra veggies (zucchini, broccoli) with the noodles and dressing. So good! Really, really good recipe, but I skipped the mushrooms. It doesn't get any easier than this. I also live off rotisserie chicken like every day of the week, so I'm always looking for new ways to incorporate the it into dishes.